Pangong Tso, which means “long, enchanted lake” in Tibetan, is very aptly named. The view of the 134 km long lake with backdrop of snow capped mountains and clear blue skies can be described as “enchanting.” On a good day, the rays of sunlight shining through the sparse clouds create an illusion of water in the lake changing colours. The best time of the day to enjoy the views are in the evening just before sunset and in the morning just after sunrise – this experience lets you witness both by staying overnight in eco-friendly tents overlooking the lake. The lake is one of the largest natural brackish lakes in India – brackish water is more saline than fresh water but less than seawater, usually resulting from the mixing of seawater with freshwater. As a result of this composition, there is very little aquatic life in the lake, with the exception of small crustaceans and ducks over the lake surface. The temperature of the water in summer is close to freezing, while in winter the lake completely freezes over. On this experience, visit the spectacular Pangong Tso and stay overnight at eco-friendly tents overlooking the Lake. Immerse yourself in the culture and heritage of the region by visiting some of the oldest and largest monasteries in Ladakh, including the Shey Palace and Monastry, Thiksey Monastry and Hemis Monastry. 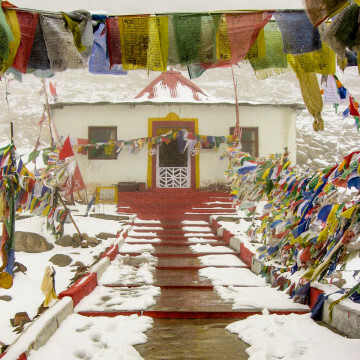 After meeting your guide, you will be driven in an SUV to Pangong Tso via Shey and Thiksey. You will first be driven 15 km south of Leh to visit the Shey Palace and Monastry, which were built in the 17th century. You will then be driven 3 km to the Thiksey Monastry, also built in the 17th century and one of the largest and richest monasteries in Ladakh. You will then be driven to the spectacular Pangong Tso, located on the border of India and Tibet. Stay overnight in an eco-friendly tent at Pangong. Begin your journey back to Leh in the morning. You will stop at the Hemis Monastery, founded in the 17th century and one of the largest monasteries in Ladakh, located 45 km south of Leh. After the visit, you will be driven back to Leh. Experience includes: Overnight accommodation, Transportation in a SUV, All entry fees and permits.